Black Diamond Extra Aged Balsamic for sale. Buy online at Zingerman's Mail Order. Gourmet Gifts. Food Gifts. Ultra luxe and ultra aged. Just when you thought balsamic couldn’t get any more luxurious, Acetaia del Cristo, the maker of our traditional balsamics from Modena,with three sumptuous elixirs that will leave you gobsmacked. The first two are each made in barrels that are more than 50 years old. Over the decades, the balsamic and wood flavor each other. After more than five decades, the barrels create an astounding depth of flavor, with incredible nuance and complexity in each drop of balsamic. First is the Francobollo, which comes nestled in a faux-leather case. The second is the Black Diamond, tucked in a bespoke wooden box decorated with a design that’s been fire-etched by hand on the lid. The Paradise Fabulous is aged in barrels dating all the way back from the end of the 19th century. 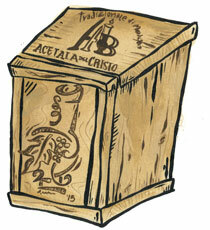 It comes in its own hand-painted, handmade wooden box. We’ve brought all three of them on just for the balsamic blowout, then they’re gone. It probably goes without saysing but quantities are draconically limited.